Provides railing in several styles including "drooped chain" and solid bar, inclined ladders in three sizes, vertical ladders, mast details, deck edge antennas, flight deck support girders, flight deck safety nets, two flight deck windbreaks, two boat monorail extensions, aircraft propellers and landing gear, four D.F. antennas, island yardarms and mast braces, conning station windows, four flight deck searchlight doors, and over 100 relief-etched crew figures including replicas of Admirals Nagumo and Yamamoto. 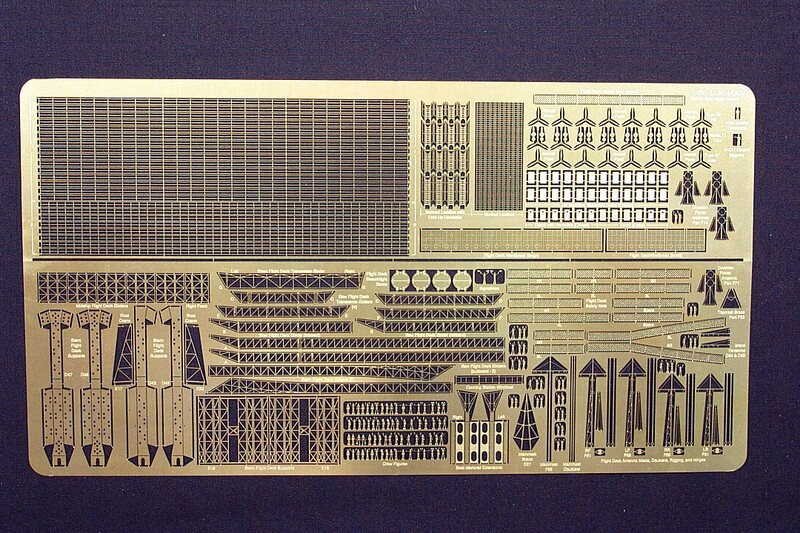 Fits Hasegawa plastic kit of IJN Aircraft Carrier Akagi in 1/450 scale. SEE PHOTOS AND A REVIEW OF GMM'S 1/450 AKAGI DETAIL SET!